Genkwa flower (Yuanhua)-Daphne genkwa Sieb. et Zucc. Botanical Name: Daphne genkwa Sieb. et Zucc. Part Used & Method for Pharmaceutical Preparations: The flower buds are gathered in spring and dried in the sun, baked or fried with vinegar. Functions: 1. To transform water and stop cough; 2. To resolve phlegm and stop cough; 3. To kill worms. 1. Edema in the face or body, ascites and retention of fluid in the chest. Genkwa flower (Yuanhua) is used with Kansui root (Gansui) and Peking spurge root (Daji) in the formula Shizao Tang. 2. Sudden cough and cold-damp type of chronic bronchitis. Genkwa flower (Yuanhua) is used with Jujube (Dazao). 3. Scabs, white ringworm and stubborn ringworm. Genkwa flower (Yuanhua) is ground into powder and combined with powdered Realgar (Xionghuang) and pig fat oil for external application. 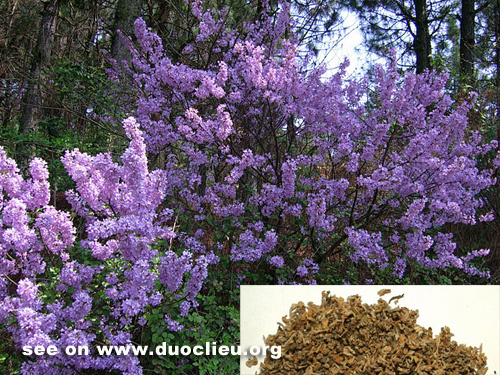 Cautions & Contraindications: This herb must not be used with Licorice root (Gancao) as it counteracts it, and Genkwa flower (Yuanhua) is contraindicated during pregnancy.